﻿﻿﻿﻿﻿Without volunteers, our state parks just wouldn’t be the same. ﻿﻿﻿﻿﻿﻿﻿As the sun was breaking over the eastern horizon, Mary and Dave Elder stood on the observation deck overlooking Ibis Pond at Estero Llano Grande State Park. Birds abounded. Several species of ducks dabbled and dipped over the surface, shorebirds scampered along the muddy shorelines, coots complained, and herons stalked with sedate deliberation in the shallows. The Elders, Texas state park hosts, were somewhat concerned about their first volunteer assignment: leading a bird walk through the park. Would anyone show up? If so, how many? Would they do a good job? As park visitors started to arrive, the Elders began their work and their worries disappeared. After a short introduction, they began a three-hour hike through the park. During the walk, they identified birds, plants and other natural features and explained the history and ecology of Estero Llano Grande and the surrounding area. At the end of the walk the Elders were rewarded with applause and thanks from park visitors. Successfully completing this walk, they saw their initial worries disappear, and their confidence soared. Now five years later, volunteering at Estero Llano Grande is a significant part of the Elders’ lives during their winters spent in the Rio Grande Valley. Garcia says volunteers and hosts like the Elders spend a lot of time learning about the park in order to share information with visitors. “We have and have had several volunteers who have contributed to the development and growth of this park. Many of them are returning volunteers,” Garcia says. One such couple, Larry and Linda Luff, celebrated 10 winter seasons of volunteer service last year. The Elders are passionate volunteers who also volunteer in Atikokan, their small hometown in northwestern Ontario. Both Mary and Dave Elder have a long history of being involved with numerous committees, boards and associations. In a professional capacity as the former superintendent of a million-acre wilderness canoeing park, Dave Elder established and ran an extensive volunteer program himself for many years. The rewards are impressive. Mary and Dave Elder have made long-lasting friendships with park staff and other volunteers. They have helped to make the visitor experience more enjoyable and rewarding. 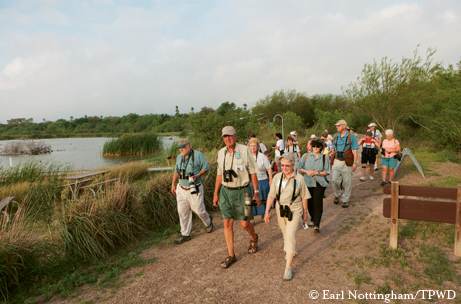 Each year they see returning bird walk participants who are not just park visitors but now are old friends. For the Elders, the ultimate payoff is to see the look of wonder on the face of a park visitor after they have pointed out a clump of brown leaves on the ground that magically transforms into a common pauraque. The Texas Parks and Wildlife Department volunteer program is an excellent opportunity for anyone interested in a challenging and rewarding experience. Programs throughout the state offer a broad range of volunteer options that can be tailored to fit individual talents, experience and time frames. In 2010, more than 12,000 volunteers contributed 950,000 hours of service, valued at $17 million. Volunteering is a great way to experience the outdoors, promote conservation and outdoor recreation and share your passion. If you would like to learn more about volunteering for TPWD, search for volunteer opportunities or sign up as a potential volunteer, go to www.tpwd.state.tx.us/involved/volunteer.